Facebook’s advertising platform has undergone significant development and now provides a wide range of sophisticated and powerful targeting features. There are 3 million Facebook users in NZ, and 1 in 2 New Zealanders actively check their facebook every day. And, on average, each of these Kiwi users clicks on 16 ads per month. 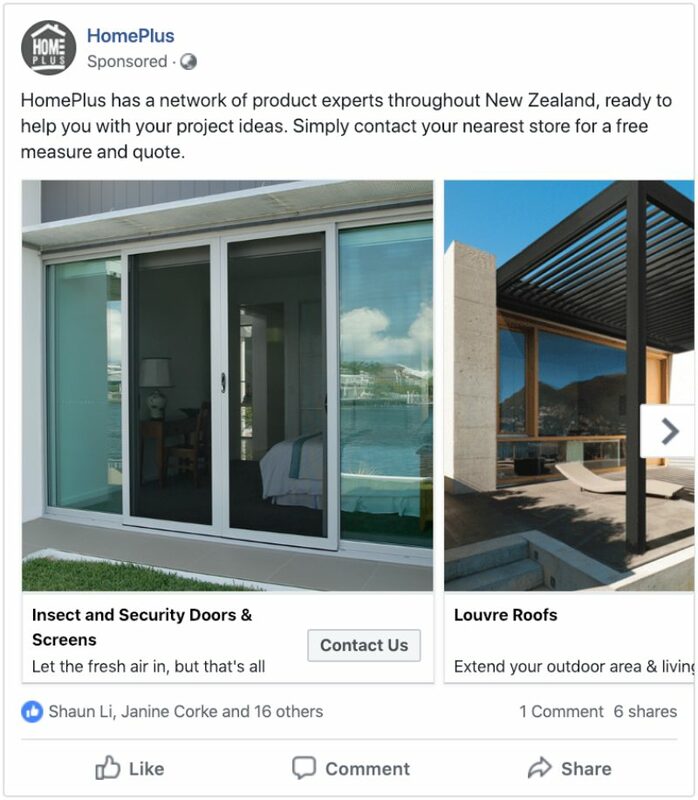 This is why we often recommend Facebook advertising in tandem with Google Ads. A common strategy for our clients is to drive new customers to their websites with Google Ads, and then 'remarket' ads to website visitors later when they're on Facebook. Highly specific targeting of ads to relevant audiences. Effective at engaging people while they're using their mobile, or on the move. Wide range of display ad formats that are highly engaging and interactive. Cost-effective with good return on investment. Great for building your image and brand awareness. What are remarketing ads and how do they work? Normal ads can be targeted to specific audiences, for example, females aged 25-34 who are interested in home décor content and are within 3km of an interior design event. Remarketing ads work differently, using a small piece of tracking code on your website. We can target remarketing ads to, for example, people who found your homepage on Google, then viewed at least 2 more pages including a specific group of product pages. Remarketing ads can be made specifically for people who show interest in specific products. Remarketing can quickly become complicated and there are many other ways of targeting customers, so call our team on 0800 234 374 or contact us for more information. What different ways can ads be targeted to specific people? Adhesion charges a one-off Facebook Advertising setup fee of $339. This includes putting together 2 campaigns for your Facebook Advertising account, each with 2 sets of ads (total of 4 ad sets). We can create more ads for you for $79 per set of additional ads. Choose your advertising budget, from as little as $5 per day (payable directly to Facebook). One of Adhesion's specialists will be assigned to managing and optimising your Facebook Advertising account. Adhesion's campaign management fee tiers relative to the size of your monthly advertising budget. Adhesion's unrivalled reputation started with Google AdWords in 2007, and has expanded to many platforms including Facebook Advertising. Facebook's certification process is relatively young, and there are many self-proclaimed Facebook 'experts' to look out for. Outsourcing your online marketing can seem like a daunting decision, so please feel free to check out Adhesion's Facebook reviews and Google reviews. As advocates for transparency, we'll never lock you in with fixed contracts, or charge you cancellation fees or hidden costs. You can leave anytime and take your Facebook account with you, so you can rest assured that we'll work hard to meet your goals. Adhesion is a certified Premier Google Partner with close ties to Google representatives. As a local SME, we better understand most of our clients' businesses, and liaise directly with Google to help them understand our clients' needs. Download our Facebook Ads info pack detailing our packages designed for small NZ businesses.